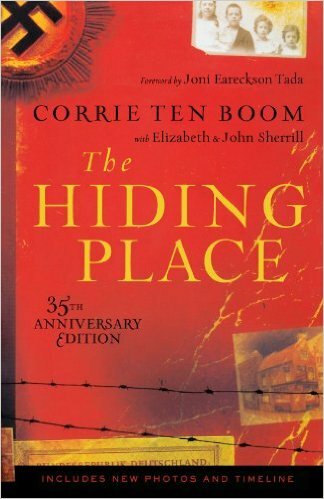 Corrie Ten Boom was born in the Netherlands on April 15, 1892. She was the daughter of a jeweler/watchmaker. She lived in a town called Haarlam which is near Amsterdam. She eventually became a watchmaker herself- being the first female licensed as such in 1922. Her family lived upstairs from their shop and were strict Calvinists which meant offering aid to those in need. When the Nazis invaded the Netherlands in 1940, it was no longer safe for Jewish people to walk the streets. Corrie would make house calls to collect their timepieces and then return them once she’d repaired them. On one visit to a Jewish home, when the father was called upstairs by his children to tuck them in, Corrie realized these people were trying to keep up a normal life in abnormal circumstances. At any time, there could be a knock on the door and they could be hauled away in the back of a truck. She, at that moment, asked God to use her to help the Jewish people. Her family had a secret closet installed in Corrie’s bedroom. It could hold 6 people if they stood. They also had a buzzed installed so there would be a one minute warning if the patrols were on the streets. This would give the people they were aiding a chance to hide. It is believed Corrie and her family saved over 800 lives. Eventually, someone turned them in and Corrie’s father and sister died in camps. The six people they were hiding at the time weren’t found and after staying in the closet for three days, they were rescued by the Dutch underground. Corrie was released from the camp where she was sent some ten months after capture without a reason given. If you have never read The Hiding Place, you should. I read it in middle school and it has always stayed with me. What a brave, Christian lady she was. Corrie died on her 91st birthday, April 15, 1983. The Jewish belief system is that only specially blessed individuals are granted the privilege of dying on the date of their birth. Though she was not Jewish, she truly was a blessing to a number of them. I read The Hiding Place a number of years ago. And yes, it is inspiring. I didn’t know that she died on her birthday or that it had that significance. Thanks for sharing. Wasnât it a moving book? She was amazing. I saw the movie and it had her at the end. I found it heartbreaking; my husband found it inspiring. I think itâs a bit of both. I haven’t read this but now I think I have to. Thanks for this Friday Fact. I’m not sure how I hadn’t heard about this story, but I’m glad I have now. It’s quite amazing what she and her family were able to accomplish. Her dad was in his 80s.